In this document, you can find mandatory steps of purchasing configurations. NF metals have a changeable price strategies to react flexibly to changes in price determination at short notice, we will activate NF metal processing. There are several different rate determination methods available for non-ferrous metals, for example, fixed rates, key date rates, average rates and pricing arrangements. The prices are determined by London Metal Exchange (LME) globally. NF Processing in SAP is not limited to NF Metals only. One can use NF processing for any type of goods if the prices do change within short periods of time. For example; you assign a contract that has a constant quantity but price will be updated everyday from LME. Let me explain SAP solution ! 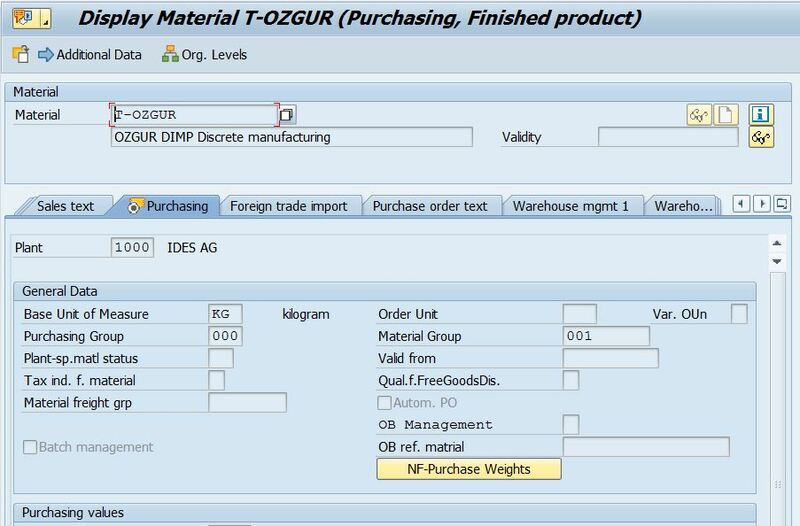 Prerequisite : Business function set DIMP for Mill Products need to be activated via Switch Framework Customizing (SFW5). You can use BC Sets for configured business process . Tcode : SCPR20 –> Activate it. SPRO -> Logistics – General -> NF Metal Processing -> NF Cross-Application Components -> Maintain Basic Settings For NF Metal Processing. When you finish this step, you will find DI specific paramaters in Purchasing view of material master. You can differenciate this configuration based on industry,material type etc. 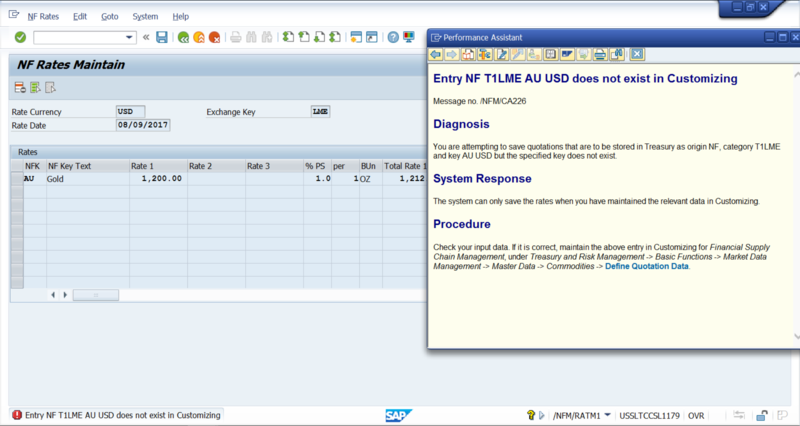 Sap suggest us copy NFM0 to create own condition, but you have to copy this condition from 000 client. I tried to create my condition (YMCH) without referance. If you want, you can create a condition with condition class Discount or Surcharge !! 3. 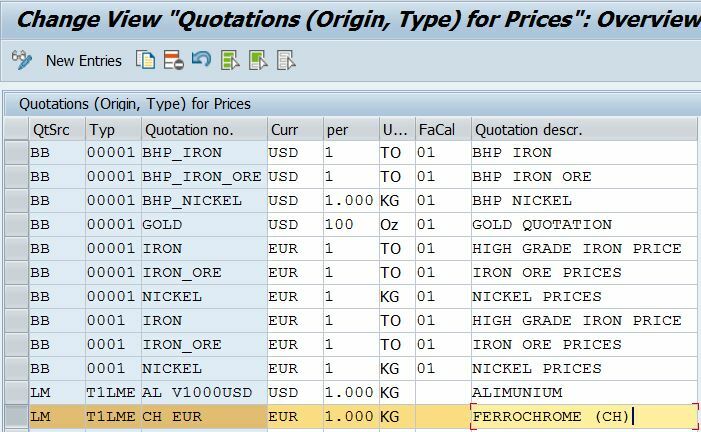 Define period determination rules for quotation and currency. 4. Define a CPE term rule. 5. Define a CPE term for the above condition type. 6. Define a CPE formula for the above condition type. 7. Create a vendor pricing procedure. 8. Create a new entry for the pricing procedure determination to ensure that the previously defined pricing procedure is determined for the newly created vendor pricing procedure. 9. 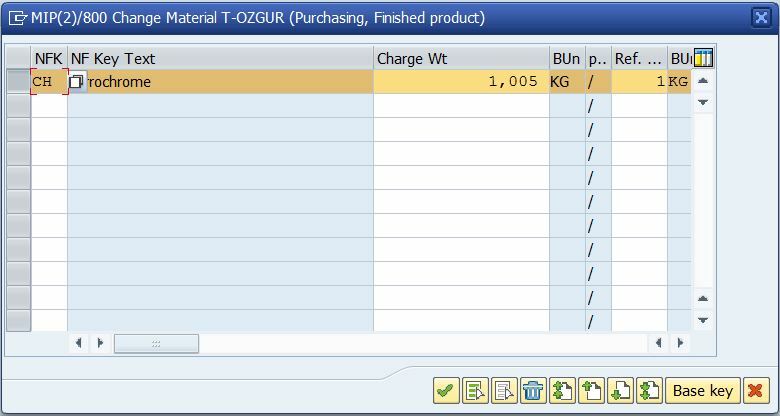 Create a new entry for the formula assembly procedure determination using the same key attributes as for the pricing procedure determination. 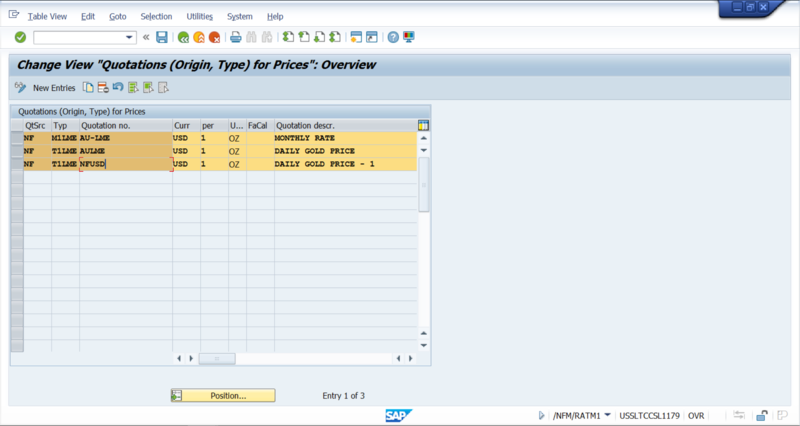 Use one of the formula assembly procedures provided by SAP. 10. Create a vendor and assign the previously defined vendor pricing procedure to vendor. 11. Create a material that can be used in purchasing. 12. Maintain conditions for formula assembly for the combination of the created pricing condition type, vendor, and material, and propose the previously defined formula. 13. Maintain price quotations and currency exchange rates valid within the period start and end dates, which will be evaluated as period determination rule results of the used CPE formula. 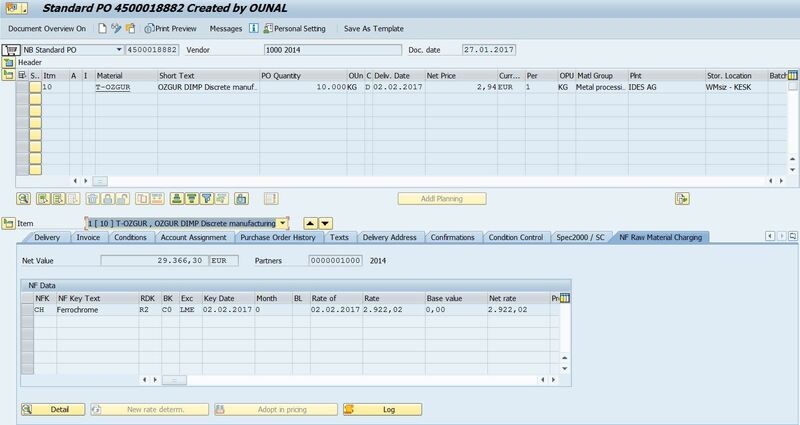 Sap suggest us copy NFM000 schema to create anew one, but you have to copy this schema from 000 client. I created my schema like a given belowed. 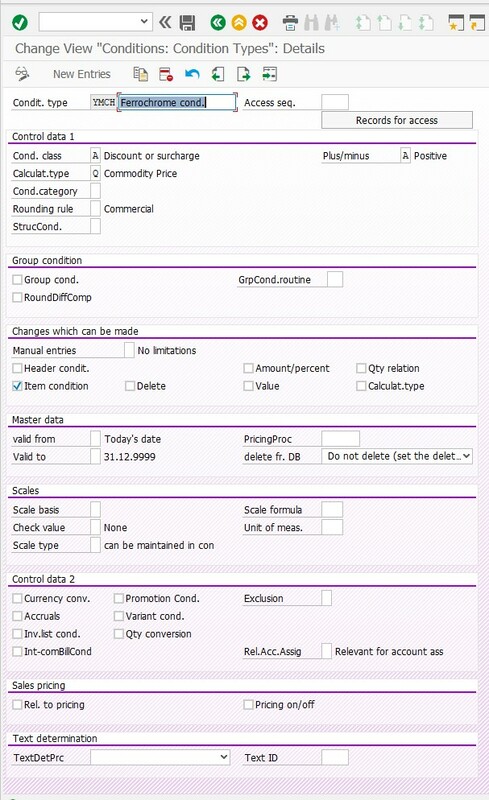 You can assign calculation schema based on schema group purchasing group and vendor. Double click onto Base Key and define base keys. Base keys are assigned to material master. If you want, you can fill out base value that take into account calculation of net price. You have assigned the NF category CH with Condition Category Net Rate to the condition type YMCH. Note : If you want, you can create own routine for your requirements. You can configure field control based on rate determination key. Master data for managing this process that vendor and material masters. We assign some parameters to master datas. Exchange key is assigned to purchasing view of vendor. Click base key to assign. Master data assignments are completed ! Assume that you have a contract that price will be recalculated from LME according to post good receipt date . You can define net rate or total rate according to your process. When maintaining rates, the value stored for rate 1 is normally used to determine the net rate. However, an appropriate rate determination key entry in customizing enables you to use rate 2 or 3 instead of rate 1 to determine the net rate. My price list for this example. When you create a PO, you will find default values for NF Default Values. If you want, you can adopt for all items. The most important points that determination of key&rate date and rate of material. Also, this must update to pricing schema. Why SAP calculates 29.366,30 EUR ? Because of charge weight is defined 1 KG = 1,005 KG in material master. In pricing schema, i benefit from exclusive functionality to eliminate PBXX in case of YMCH active. If you want use a specific schema for only DIMP, you can delete this condition from schema. It is your choice, but be careful that you must have a gross price condition. If you check pricing schema of this scenerio, you will see 9 for Subtotal on the YMCH condition. 3000 KG good receipt is done ! When invoice verification, you can update NF prices according to post good receipt day. If you have custom requirement, you can develop your routines. Thanks to Kıvanç Bilgin for https://blogs.sap.com/2016/05/23/non-ferrous-nf-metals-processing/ that inspired to me. Nice presentation with good examples. Thanks venu gopal , i hope that it would be useful for someone .. I hope that someone benefit from it ! Nice Document and very useful one. Great Job! Can you please share your valuable experience in implementing SAP in non-ferrous metals Industry in a separate blog. I hope that would be useful to many. Thanks. Could you try to define ‘Qoutation No’ like a AU for USD ? Thanks venu gopal , Could you please tell us how to customized for “Exchange key is assigned to purchasing view of vendor(ECC6) or BP (SFIN).”? 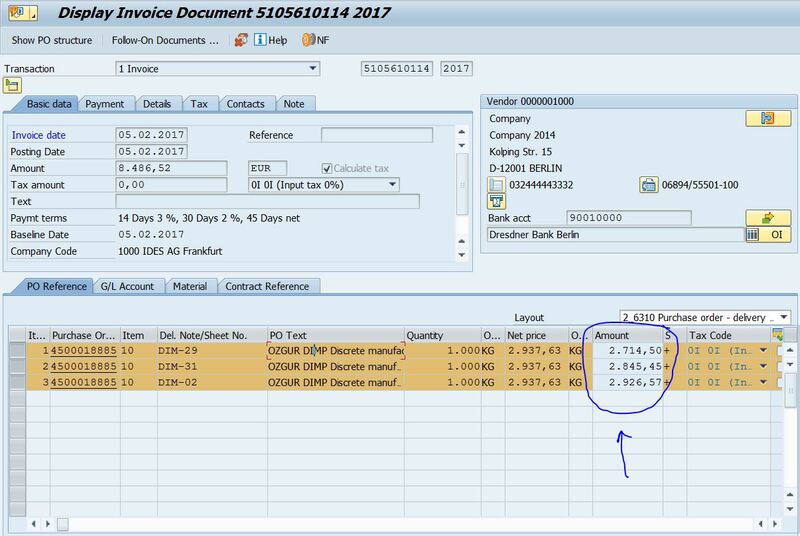 In S/4HANA transaction “Business partner” the field “Exchange Key” is not yet displayed. There are plans, to add in future. The field “/NFM/BOESL” is still in DDIC. Currently you would need to add as a customer project enhancement. Could you please kindly provide me more detail regarding the customer project enhancement of the field ‘Exchange key” maintained in business partner screen? Thanks for your valuable informations.